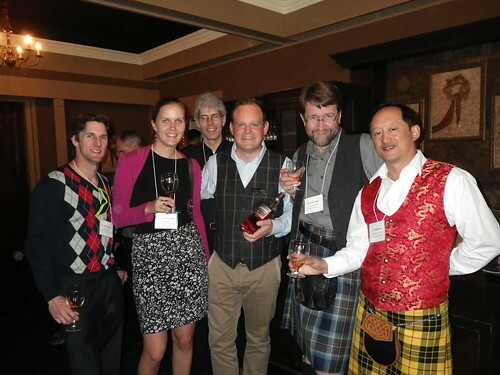 We will have tastings of scotch whisky coming to the 2013 Gung Haggis Fat Choy Dinner. Auchentoshan Three Wood is one of my favorites single malt whiskies. Fortunately, the representatives of Auchentoshan will be bringing 3 whiskies: Classic, 12 Year + Three Wood. The Auchentoshan distillery is just outside of Glasgow, on the North side toward Loch Lomand. The first day of my visit to Scotland… I went to a Ceilidh dance at The Hub in Edinburgh, for the finale weekend celebrations of the Year of Homecoming Scotland. 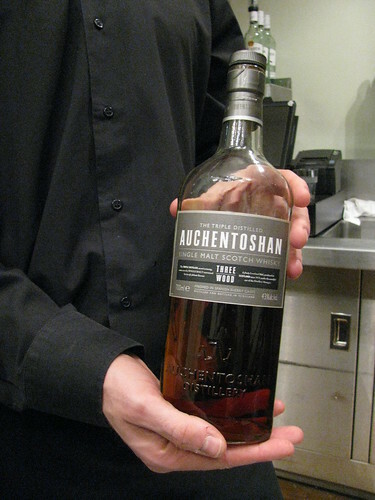 I asked the bartender to recommend a whisky for me, and he picked up a bottle of Auchentoshan Three Wood. It was very nice. The second time I had Auchentoshan was when I bought a bottle of Three Wood for my bagpiper friend Allan McMordie’s 55th Birthday. I had remembered that I liked it in Scotland, and it was on sale at the LCB store. Good choice. We both liked it. We have had free scotch tastings at Gung Haggis dinners before. Last year, we had tastings of a blended whisky called Kuch Nai – it is marketed for India and is a value blended whiskey that is designed to compete with Johnny Walker Red Label and Famous Grouse. In 2008, Johnny Walker was tasted from bottles of Black, Green and Gold Label brands. In 2009, we tasted Famous Grouse blend, as well as Macallan and Highland Park single malts which are what is used in the Famouse Grouse. Here we are with three people from Edgemont Wines and Spirts: John, Crystal and Tony. 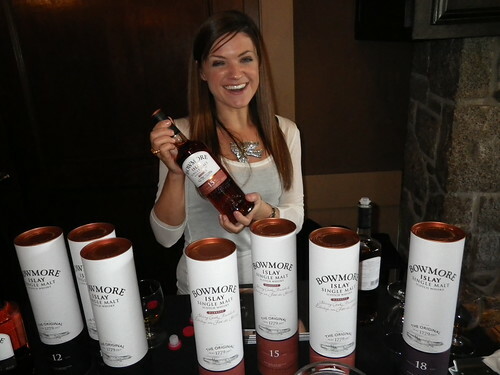 The representative from Auchentoshan/Bowmore holds a bottle of Three Wood. Don Harder is my friend and I named him the official Gung Haggis Fat Choy whisky ambassador, because 1) he loves good whisky and 2) he was going to Scotland this past summer, and planning to visit lots of distilleries. Tony is the fellow third from left. He poured the scotch tastings last year and gave quick talks about it. He’ll be doing the same again for this year. And if you can believe it – the representative for Lifford Wine & Spirits is Chinese Canadian. Her last name is Lau, and she told me she had always been interested in coming to Gung Haggis Fat Choy Dinner. Welcome Irene.. and thank you for bringing the single malt whisky! can be purchased ticket online or over the phone with a credit card, please call Kristin Cheung at Ricepaper magazine at 604-872-3464. This entry was posted in 2013 Gung Haggis Fat Choy Dinner, Uncategorized, Wine, spirits and beer on January 15, 2013 by admin.